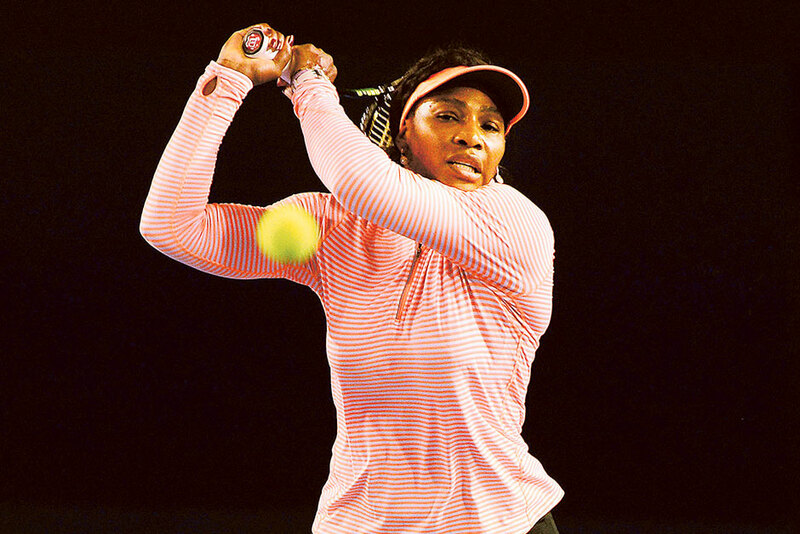 Melbourne: Defending champion Serena Williams insists she is fighting fit in her bid for a seventh Australian Open crown despite an injury scare and lack of match practice. The world number one has barely played since the US Open in September, when Roberta Vinci shattered her dream of a calendar-year Grand Slam in a heart-breaking semi-final defeat. Williams attempted a comeback at this month’s Hopman Cup mixed-team tournament in Perth but retired with soreness in her left knee, sparking speculation that at 34, she could be past her peak. But the American 21-time Grand Slam champion, who also battled knee problems in the latter half of 2015, insists she is “ready to go” at the Melbourne Park tournament starting Monday. Melbourne Park has been a happy hunting ground for Williams. She claimed her first Australian Open title way back in 2003, beating elder sister Venus in the final, and reached her sixth last year when she toppled arch-rival Maria Sharapova. Williams is not the only player struggling ahead of the opening Grand Slam of the season, with injuries taking their toll on many of the leading names. Despite the new season being barely underway, the women’s top five have all had troubled lead-ups to their first major test of 2016. World number two Simona Halep (achilles), Garbine Muguruza (foot), Agnieszka Radwanska (leg) and Maria Sharapova (forearm) have all been battling niggling problems that forced them out of warm-up tournaments. The world numbers six and seven, Petra Kvitova and Angelique Kerber, joined them in the sick bay suffering gastrointestinal illness, leaving the Melbourne showpiece unpredictable. Like Williams, Sharapova, who won her only Australian Open title in 2008, will enter this year’s tournament with little match practice, although she called her decision not to play last week’s Brisbane International precautionary and declared on Tuesday she was now healthy. It follows her second half of 2015 being wrecked by injuries, first to her right leg which forced her to miss the US Open. She then retired from her comeback match at September’s Wuhan Open with a left forearm injury. Romanian pocket-rocket Halep also withdrew from Brisbane but was playing this week in Sydney, and knows she has a huge task ahead to win her maiden Grand Slam, seeded to meet Williams in the final. “I beat Serena once in my life, so it’s really important for me,” said Halep, who has won just one of seven matches against the American and admitted her achilles injury was “still there but now I don’t feel pain any more”. “To meet Serena, it means that I have to do finals. So let’s go there in Melbourne to see if I can be there,” she added. The early-season injury list has opened the door for two-time Australian Open champion Victoria Azarenka, now fully fit after two troubled seasons, who beat Germany’s Kerber to claim the Brisbane crown. It was the resurgent Belarusian’s first piece of WTA silverware in two-and-a-half years and sent her soaring up the world rankings to 16, a timely confidence boost. In Brisbane, Azarenka dropped just 17 games in four matches and appears to be getting back to her best. “I’m definitely a lot more comfortable, a lot more calm, a lot more aware. Happy. Very happy,” said the former world number one. American Sloane Stephens, who made the Australian Open semis in 2013, is also in good form, winning the lead-up ASB Classic in Auckland. But she too then succumbed to illness, withdrawing from the WTA event in Hobart this week. World number ones Novak Djokovic and Serena Williams were named the top seeds on Thursday for next week’s Australian Open with organisers aligning with the current rankings. The 2016 Australian Open runs from January 18-31.